Poker’s popularity has skyrocketed over the last decade as televised tournaments and high stakes hands have pushed Texas Hold’em and other variations into the spotlight. Unlike traditional casino games in which players are battling against the dealer and the house, poker puts players’ skills to the test by pitting them against one another. As a result, poker odds depend largely on a unique balance of luck and skill. So, do you think you’ve got what it takes to bring home the purse in a big time poker tournament? Let’s take a look at a few of the basics, just to refresh your memory. If Hold’em is your game, developing an effective hole card strategy is among the most important details of any successful trip to the tables. For example, a pair of aces is the strongest set of initial cards available in the game, but every hand can be ranked in terms of potential to win. A suited king and ace are always a good hand to play, and a suited queen and king combo is worthy of your attention. However, unsuited cards, low pairs and weak combinations can all be recipes for disaster. Get familiar with an effective hole card strategy before starting your tournament. While you’ll still need a little luck to win, starting on the right foot is never a bad thing. Let’s say that your two hole cards are suited, and the flop presents two additional cards of the same suit. Now, you’ve got two chances to lay claim to a fifth suited card and, hopefully, win the pot. Do you know the odds of making the hand? While other players’ hands will have an impact, the probability of you securing the flush with either the turn or the river is about 34.97 percent, on average. If you’re shooting for an outside straight, your odds will be closer to 31.45 percent. The probability of securing the right card is important, but there’s more to a good poker strategy than simple odds. You’ll also need to calculate the risk/reward of pursuing the fifth card based on the money in the pot. For the flush, the breakeven ratio of money in the pot to the amount you’ll need to bet should be at least 1.86. Making these calculations on the spot is a great way to improve your chances of a poker victory. If you’re interested in getting more in-depth with the strength of particular poker hands and their prospects against the competition, search the web for a poker odds calculator. Using complicated coding and formulas, these tools can help you determine the probability of any possible outcome in Texas Hold’Em based on the cards currently on the table. Using this as a tool to sharpen your poker knowledge could help you win some cold hard cash down the road. While poker may appear to be a relatively simple game of chance to the uninitiated, there’s plenty of variables and formulas to consider when weighing your odds. 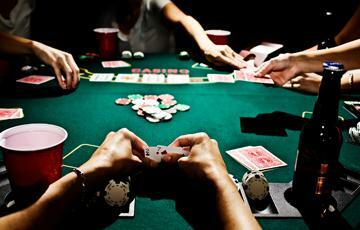 Give yourself the best chance of success by doing your homework, and you could be on your way to a poker championship.